New 'Rocky And Bullwinkle' Is Something We Hope You'll Really Like Amazon's The Adventures of Rocky and Bullwinkle is no lifeless retread — it captures the anarchic, slightly sardonic tone of the original, and delivers solid gags that stand on their own. 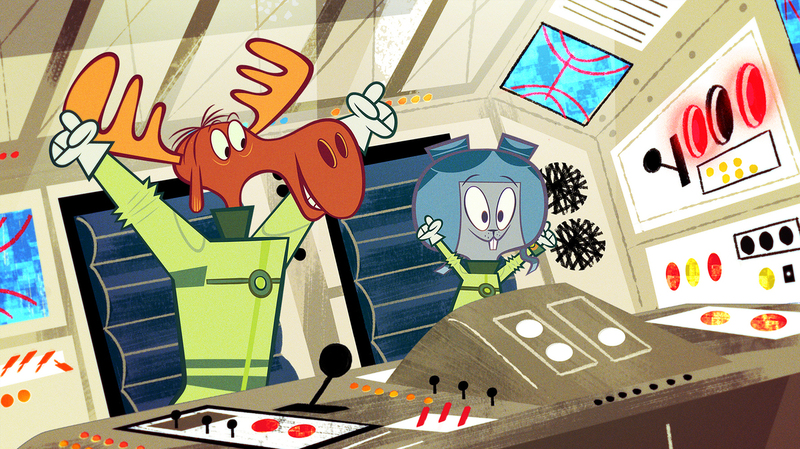 "Nothin' up mah sleeve ...": Bullwinkle and Rocky return in a new animated series on Amazon. It's killing us slowly, steadily: Every time an old, smarmy sitcom, or a pallid network drama, or a toy ad that masqueraded as a cringeworthy children's cartoon gets dredged from the feculent muck of history's lake bed and rebooted for a contemporary audience, our cultural blood pressure incrementally drops, our collective pulse grows that much threadier, our soft tissues go just a scosh more necrotic. That's because these properties exude nostalgia's deadly poison — they're sticky with it — and there is no antidote. There was a moment, perhaps, when we could have saved the patient. That time has passed; we, all of us, missed it. These reboots, once novel and notable — infrequent curiosities, blips on the pop culture radar — have grown incessant, inevitable, inescapable; they descend on us monthly, weekly, daily, in great choking swarms. Nostalgia is no longer a part of our culture. It has become our culture. And the toxin it carries has leached into the groundwater. It riddles the food chain. It's airborne. We are lost. No, I know what I just said. I stand by it. I am adult, capable of holding two separate and contradictory thoughts in my head at the same time. I recommend exercising this ability at every opportunity; it will serve you in good stead, if you maybe never go online again. The original animated series starring the dimwitted Bullwinkle J. Moose and his partner, Rocky the Flying Squirrel, premiered in 1959. Each episode of the show, which went by several names as it switched networks and entered syndication, featured two serialized adventures of our main heroes alongside several recurring segments like "Fractured Fairy Tales," "Aesop and Son" and "Peabody's Improbable History." They, like all of Jay Ward Productions' output, shared a loopy and slightly sardonic sensibility. The character design was idiosyncratic, the animation passable — but the scripts were what set the show apart, packed as they were with rat-a-tat wordplay and dumb puns; contemporary cultural references and vaudevillian schtick; self-aware meta-commentary and classic, cliffhanger-studded adventure. It lived on in syndication, and several reboot attempts, and spinoff movies. The latest series, streaming on Amazon on Friday, May 11, is produced by Scott Fellows (a veteran Nickelodeon/Cartoon Network showrunner) and executive-produced by Tiffany Ward — daughter of Jay. 1. Rocky and Bullwinkle live in Frostbite Falls, Minn. They go on adventures. 4. A clarion-voiced narrator (William Conrad in the original, Daran Norris here) frequently interacts with the characters. 5. The designs of characters have been tweaked — made a bit more angular and exaggerated, and the timing of their movements amped up, in ways that will remind you of Ren and/or Stimpy. The midcentury-modern backdrops have gotten more abstract, and the intensity of their colors boosted. 5. There are many — many, many — good jokes: rat-a-tat wordplay and dumb puns; contemporary cultural references and vaudevillian schtick; self-aware meta-commentary and classic, cliffhanger-studded adventure. What's important — what proves crucial, in fact — is that these jokes don't work because they remind you of the original. The show isn't drafting on the nostalgic affection you may feel for these characters. The jokes work, period. They exist within the original show's framework, yes — they depend on certain familiar character dynamics. But they would land as hard on any other show, starring any other characters, in any other setting, because they're just such solid gags. If anything, the show's infrequent nods to the original series — brief interstitials featuring Bullwinkle on a stage doing some bit of business with a magic hat, say — feel like the merely dutiful exercises they are, because they don't connect to anything else. They just ... lie there.